KTX 20 permanent coating | PHSC Chemicals sp. z o.o. The coating is fully transparent, one layer is sufficient for complete protection. Features KTX 20 – single component, transparent after drying, polymer coating. Layer thickness – 8-25 µm. Output: 15-45 m2/L. Coating durability: 20 years. Multiple graffiti removals. Application Applicable on non-absorbent, smooth substrates, such as varnish, epoxy, powder or polyurethane coatings, plastics, polycarbonate, steel, aluminium, ceramics. Applicable on inner and outer surfaces of trams, buses, trains, on ticket machines, parking meters, posts and benches. Impact The coated surface is protected against spray paints, water-based markers, ink, weak acids, alkali, bird droppings and atmospheric pollution. Possesses antistatic and anti-poster properties. Applicable in a single layer. Due to its extreme chemical and mechanical resilience it is particularly recommended for protecting urban infrastructure elements and multi-chamber polycarbonate panels. In the case of damaged transparent surfaces such as polycarbonates or Plexiglas which have become tarnished or oxidized the coating restores its natural gloss. How does the KTX 20 work? 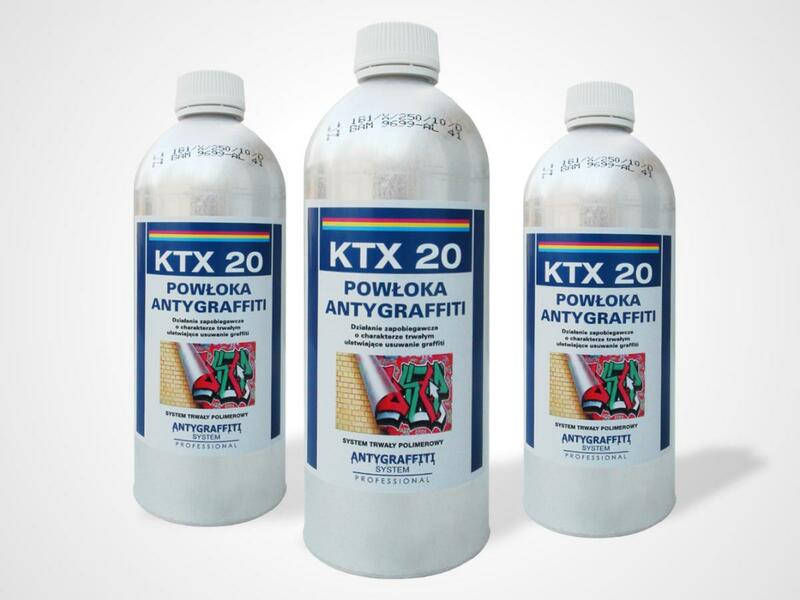 Examples of removing graffiti paintings from various materials covered with KTX 20.